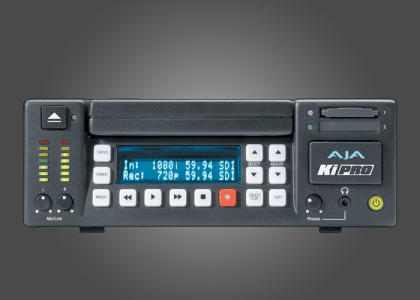 The AJA Ki Pro is a tapeless video recording device that records high-quality Apple ProRes 422 QuickTime files onto computer-friendly Storage Module media. Because it features SD/HD-SDI, HDMI, and analog inputs, you can interface with virtually any type of camera you might own or rent. Enjoy monitoring flexibility through Ki Pro’s numerous simultaneous outputs, connecting to both professional and consumer monitors. Ki Pro is portable and rugged; designed for real production environments. With the optional exo-skeleton it can sit below your camera—out of the way of your battery adapters, wireless mics and other accessories. Offering up/down/cross-conversion and a multitude of connections, integration with your other production gear is seamless.